Straight From Eden by Creme of Nature - Just Arrived! - Hairlicious Inc.
Straight From Eden by Creme of Nature - Just Arrived! I'm pretty anxious to try this new line because it's sulfate-free and plant derived with my favourite oils. I'm currently 11 weeks post relaxer. I'll be trying this product on my hair while stretching (so I can see how it works with my new growth) and right after I relax, which will be in the next 1-2 weeks. They include coconut to restore strength and protect hair from damage, avocado to fortify hair and promote overall hair healthiness, and olive oil to hydrate the strands and infuse necessary moisture. 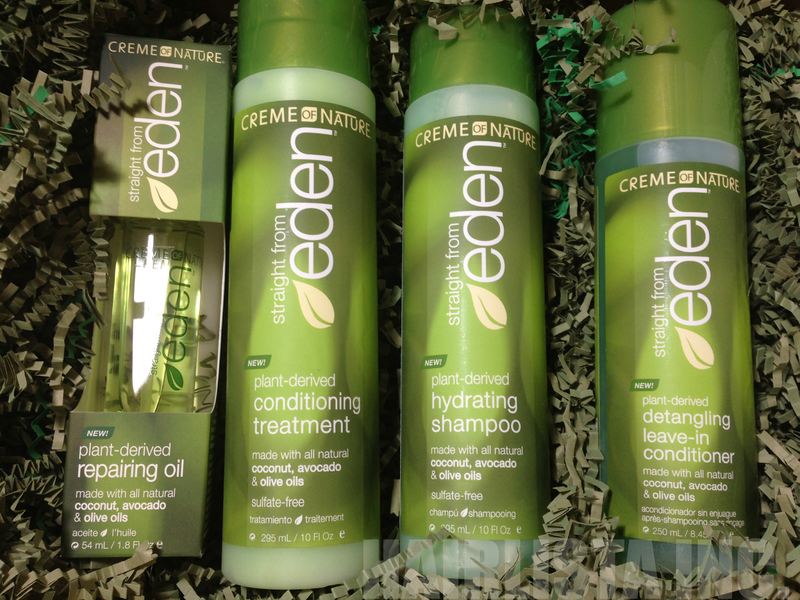 Have you tried the new Straight from Eden line? Did you purchase the relaxer? Do you know if the directions are the same as applying a no-lye/ lye relaxer? I have the relaxer, however, I'm very nervous about using a No Lye relaxer when my hair has been relaxed with Lye for over 15 years! Almost all no-lye relaxers include a step in which you have to mix the crème and liquid part of the relaxer together; this is known as the activator step. With Lye, there's no mixing. There is not really an issue with the interchanging because the focus is on the new growth. This hair has not been previously relaxed by any other method. It doesn't matter if the already relaxed hair was straightened by lye or no-lye. The same rule of no over lapping still applies. if this rule is followed i do not foresee a problem. I have interchanged before with very good results. While you do have a point, my concern is that eventually, my new growth will become my ends and I'm not entirely sure if I want No-Lye throughout my hair. No Lye relaxers are known to be a bit more on the drying side and my hair is naturally very dry. I have seen a lot of positive reviews of it. I can't wait to hear what you have to say. I will probably try it next month when I relax at 12 weeks too. I don't want to speak too early, but I must say, I'm impressed. Full review coming soon! @Sunshyne, can you do a full tutorial of your relaxer day regimen? I wish it was available. It looks like it was sent to ppl that they wanted reviews from only. I did a search for my local area, even 100 miles at and no one carries it yet. So am I a little jelly, I can be honest and say yes. I am over 4mths post and trying to cure my inner junkie so I would like to test out the line for myself the same way you are. Smh. So I guess I will wait on your review. Keep us posted. I got the relaxer system in a giveaway on Facebook, but I'm waiting to use it because I just got a relaxer 2 weeks ago. I did get some samples from the line that I'll be using soon. Nice! So far I'm testing the products out on my 12 weeks post new growth/hair and so far it's great. Full review coming soon. Will you be trying their new relaxer as well? I currently use ORS box relaxer, but was curious to try the Straight from Eden one. I have heard great reviews. I'm not sure as yet. I use a Lye relaxer (for the past 15 years) and to switch at this point in my hair journey, I'm not sure if it makes sense. Since you are using a no-lye relaxer already, it will be easier for you to switch over. We'll see. No, please how and where can one get it in nigeria? Please check your local beauty supply store. It will take time to reach international countries. Maybe you can order it from a few beauty supply stores online. im on my way to find this now, hopefully i can find!! I purchased the Relaxer and the other products and they are coming in the mail. I'll be trying out the relaxer on my next relaxer day which is soon. Also will trying out the CON Straight from Eden line of products on my wash day this Saturday!!! I have heard so much about these products. They are on my list next time I visit the hair store. It's available in some of the Walgreens stores but Walgreens online. I saw the mild relaxer, $10.49 the conditioner, leave-in and the oil ($8.49 ea) at one Walgreens store. They only one or two of the products. Out of the three BSS I checked only one had it. It costs more at the BSS. I wish Sally Beauty carried it but they said they don't. According to Creme of Nature there are no samples or coupons right now. So...did anyone actually try the relaxer yet? Can someone PLEASE do a review? I wanted to try it but their customer service rep says you cannot use it if you color your hair with 100% BAQ Jamila henna, like I do. :( I was surprised to hear this since I've used other relaxers with the henna (not on the same day) in my hair without any problems.